Maleficent is the new black. I make that statement referring to the Mistress of All Evil character Disney originated in the 1959 animated film Sleeping Beauty, now getting her own feature length, live-action film with a misunderstood backstory. The character is one for the ages and packed with a performance to match. Angeline Jolie commits to the role, flashing 90% teeth and 200% cheekbone. The character of Maleficent is great, and the film is a digital effects-laden extravaganza, the kind of fantasy epic that has "movie event of the Summer" written all over it. Unfortunately, a less-than-epic story makes for a much lesser film as a whole, never quite living up to the greatness of this classic Disney character or that performance. Read on! Jolie's Maleficent is at first a gentle soul, a fairy who lives a peaceful life in the woods where all the magical creature dwell. She fills her days swooping to and from place-to-place, flashing the powerful wings she flaps behind her with a mighty force. She's the queen of the otherworld, for all intents and purposes. One who isn't afraid to stand up for her kingdom when those pesky humans who live next door decide they don't want the strange creatures in the woods to live their happy existences. Their freaks, after all, and what humans don't understand, they naturally try to wipe out. After a betrayal, Maleficent is left broken, her wings stripped from her body, and the culprit behind this deed is crowned the new king of the human realm. Mistresses of Evil aren't to be reckoned with, after all, and the once peaceful fairy now plots an ultimate revenge against the king. From here, you pretty much know how it goes from Sleeping Beauty. The king has a daughter, played as a teen by Elle Fanning. The dark queen curses her to prick her finger on a needle on her 16th birthday, which will cause the princess to fall into an eternal sleep, and only true love's kiss will set her free. 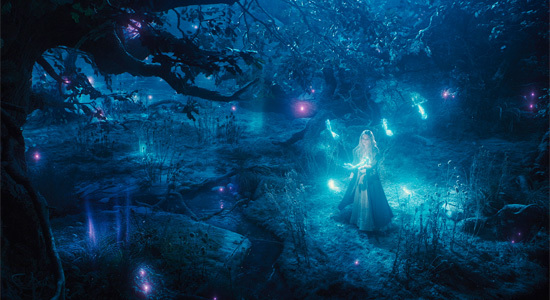 First-time director Robert Stromberg has had his own storied career in the visual effects and art direction world. The world he builds in Maleficent is beautiful, atmospheric, and worth every penny the studio spent to make this live action film a reality. So many frames in this film are strong candidates for hang-on-the-wall spectacular, and much of the imagery gets soaked in without a care in the world regarding story, pace, or even a satisfactory structure. Stromberg hasn't learned anything about pace in his days working in the effects and production design world. It doesn't help that Linda Woolverton's screenplay is water-thin, easily agitated through countless shifts in tone and with little care in developing anyone who isn't named after the movie. The king, played by Sharlto Copley, is straight Tolkien, giving in to human desires with results that slowly but surely drive him insane. Fanning's Princess Aurora is too filled with wonder about the world around her to be any kind of genuine character. Even Maleficent seems driven by only the horrific act that propelled her into darkness and the resulting vengeance she seeks on the king. 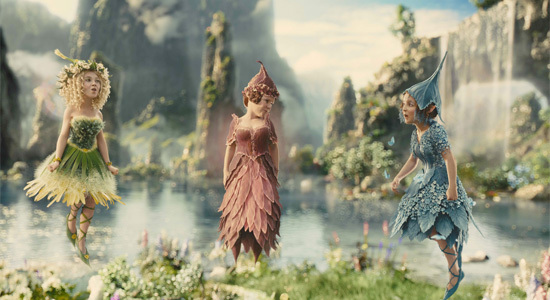 There is certainly some fun to be had throughout the film's first two acts, the beginning of the story offering up the film's biggest action sequence, an all-out battle between humans and magical, woodland creatures. It's an awesome scene that ends too soon, but there's a built-in promise that Maleficent will, at some point, deliver something grander further down the line. Unfortunately, it never does. The entertainment level peaks early, but there's a joviality through much of the film's bloated middle. Princess Aurora is swept away to the woods, presumably to keep her safe, by those three, classic pixies we remember from the animated film. The actresses embodying those familiar roles (Imelda Staunton, Juno Temple, and Lesley Manville) are all delightful enough, and their characters' antics make for some genuinely light-hearted moments in the film. This too, however, plays into the vast amount of times Maleficent fluctuates its overall tone. The eponymous character is almost giddy in how evil she's allowed to be, yet her attitude does a complete 180-degree turn when she spends any amount of time with the cursed Princess. There's a mother-daughter element to the story that could have and should have come across much stronger. All the motions are there, but the feels are totally left wasted. It's obvious to anyone who has seen a second of Jolie's performance, but her portrayal here has absolutely nothing to do with all that wasted motion. She wears the dual horns on her head with a natural presence, her magical powers and forces she uses to do her bidding never in question. The actress makes that all real enough, and during moments of excitement and action, her movements do just the same. It's not that Jolie can't carry the film. Maleficent works as well as it does because of the talented actress. Unfortunately, there's little else the film bothers attempting, perfectly satisfied with the look and attitude the actress brings to the poster. That poster, by the way, is simply Maleficent against a white background, more than a tiny indication of just how much more this film has to offer. To say that it's enough would be unjustly ignoring the shoddy film wrapped around that central character. To that I say, it's almost enough. Personally I thought it was a great movie. It was a great feminist movie and a good fantasy movie. Also, packed with a lot of 'feels' as well. I wish I knew more about Stephan's side of the story though.